Brung or Brought – Which is Correct? Home » Brung or Brought – Which is Correct? By now, you have no doubt noticed that many English speakers use the language improperly when speaking, even if they are perfectly good writers. These differences between correct and incorrect usages could be a result of regional dialects or popular slang, and they often reinforce camaraderie between familiar speakers. But, they can also make things confusing language learners or people outside of any specific community. If you’ve ever heard someone say brung in conversation, you could be forgiven for not knowing what they meant. Brung occurs with some frequency in spoken English but only very rarely in writing. Is it an acceptable substitute for brought? Continue reading to learn more. 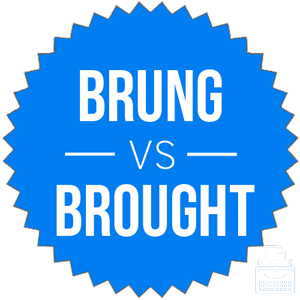 What is the Difference Between Brung and Brought? In this post, I will compare brung vs. brought. I will outline the correct word choice and use it in several examples so you can see it in context. I will also demonstrate a useful memory tool that will make it easier for you to choose brought or brung correctly. What does brought mean? Brought is a past tense conjugation of the verb to bring, which means to carry someone or something along with you, usually to a place. A woman might tell her boyfriend to bring pizza when he comes to her house, for example. If the boyfriend arrived with pizza at some point in the past, he brought the pizza. Against the advice of his mother, Johnny brought his guns to town. I brought my girlfriend to Alex’s wedding, but she embarrassed herself and I wish I hadn’t. What does brung mean? Brung is an improper inflection of the same verb. Bring becomes brought in the past tense, as mentioned above. Brung first appeared at some point in the 19th century but has never been considered proper English. Brung has never seen meaningful use in written English. If you were writing fiction and wanted to capture informal, spoken English in dialogue, you might be able to use it. Otherwise, stick to brought. Even while brought has seen a decline in use relative to all other English words, brung has not increased its market share, which further demonstrates the fact that brought is the only correct word in Standard English. Brought is the proper way to conjugate the irregular verb bring in the past tense. In other words, you should never use brung. Since brought rhymes with other past tense verbs, like wrought, fought caught, etc., it shouldn’t be any trouble to remember to use it instead of brung. Is it brung or brought? The debate here centers on the past tense of the verb bring. Brought is the correct past tense version of bring. Brung is an incorrect conjugation of the same verb. 1 What is the Difference Between Brung and Brought? Bad Rap or Bad Rep – Which is Correct?